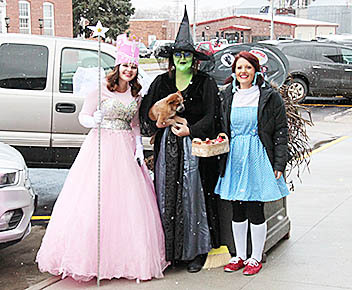 Trick-or-treaters collect their goodies at Sentinel Building Systems, Loup Power and Wells Drug Home Health. 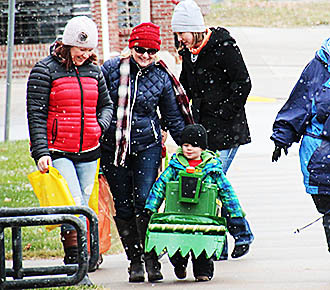 Some 350 area youngsters turned out for the annual Halloween Parade in downtown Albion despite chilly temperatures Tuesday afternoon, Oct. 31. Trick-or-treaters displayed many novel costumes, and many of the business owners and employees were dressed up for the occasion. 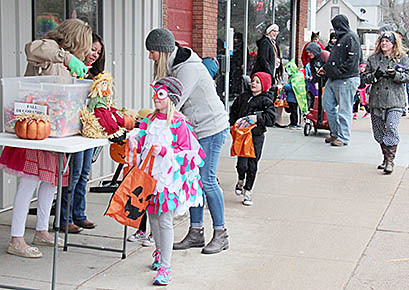 After completing the downtown circuit, many of the youngsters moved on for trick-or-treating at GSS Wolf Memorial Home and Harmony Homes in Albion. The Connect Now crew dressed up as the cast of Alice in Wonderland, including the Good Witch of the North, Wicked Witch of the West, and Dorothy. 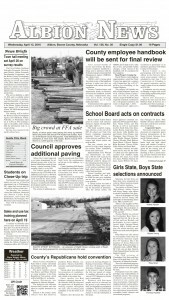 A John Deere combine was one of the more unusual costumes in Tuesday’s Halloween Parade.